wear a Do Not﻿﻿﻿﻿ Disturb sign round your necks. Brace you﻿rselves for the impact. Like KJH said the day feels like the calm before the storm!!!.. Soohyun may look selfish, weak-hearted on the breakup (I totally don't agree with that but there are so many attacks on her character, not here though) but from my point of view, she did that out of love. She had no choice or whatsoever. Yes she can tell Jinhyuk about this but what if he confront his mum? She did not want to destroy their loving mother-and son relationship just because of her, a person she thinks did not deserve happiness. It's hard and pressuring especially you know the person you love most in this world, values and loves his family a lot; and one of his family members (his mum omg) is asking you to end the relationship for the better! What is she supposed to do? There is nothing like "face-this-together" on the cards for her! The way she sees Jinhyuk runs to Jinmyung at the police station, it's the end of her. She knows no matter what is going to throw at Jinhyuk, he will often say "it's okay" but deep down he endures everything on his own and it pains her to see him like this. I really hope KJH’s good son acts to mom can melt his mom’s heart promptly. enduring any obstacles to his life and his family from being with CSH is MUCH LESS torturing than living without CSH. KJH did not make decision from naive view but he chose this being with CSH with pros and cons in his life including his family unavoidably and from the bottom of his heart. He has planned to do the best with this choice, CSH, please trust and believe in KJH and do the best ever together. “Sometimes it is cool, sometimes it is cute, and sometimes it has a lot of charms, which makes it a "lover of lovers"
The TVN 'Boyfriend' (play Yoo Young-ae / director Park Shin-woo / production studio dragon, this factory), which is making poetic dialogue and sensitive acting, Especially, the attraction of Suhyun (Song Hye-kyo) and Jinhyuk (Park Bo Gum) So I gathered moments of attraction of Suhyun and Jinhyuk. - Soo Hyun , a word with the courage to raise your thumb! The scandal between the hero and the thumb! In the 6th episode, Soo Hyun caused a heart attack with a courageous word. The reporter planted by Choi, Choi (Park Sung Geun) at the opening ceremony of the Sokcho Donghwa Hotel opened a trap by asking Suhyun what the scandal was about. So, Jin-hyuk turned back laughing that he was okay for Suhyun, which is difficult to answer, but Seo-hyun who looked at the backwardness of such a dilemma gave a surprise by acknowledging the relationship with " This was the moment of courage that Suhyun had never experienced in his chosen life and made the audience to raise his thumb. # Jinhyuk, Confession of a Scandalous Scandalist in the Face of a Woman! - 4th episode, Jinhyeok made a fascination with his stepping toward Suhyun. Suhyun was taken to the scandal by taking a photo of ramen at Jinhyuk and resting place, and the company became cluttered with Suhyun's gossip. In addition, Suhyun has been pushed to the brink because of the best wishes to call for clarification in front of the employees. At this time, Jinhyeok "Dear sir!" He called Suhyun and then stepped forward with his dignity and said, "I have some money. I will go to dinner if I will live today, "he said, pointing out that the main character of the scandal is himself. Especially in the end of the solo cliffs for the sudden hyeolhyeonhan hot hand touching Jinhyeok's solid eyes, and 'Do not ask me what this feeling. I do not know yet. The story of 'I am not going to leave you alone' is a tremendous tremor. - Suhyeon, the audience disarmed the charm of drunkenness! 11th episode, Suhyun disgraced viewers with charming shot mixed with drunkenness. Suhyeon went to Jinhyeok and the stalls and showed her confidence that he drank well. However, Suhyeon, who has been sobered, has a cute smile on his mouth and says, "I like Jinhyeok nowadays because he is next to me." In addition to this, Suhyun is more cute because she is so drunk. "I am a little cute. Actually, I'm cute style, but I do not know people. " Above all, Suhyon 's expression and tone of drunkenness caused an automatic smile on his mouth. # Jinhyuk, squid when I'm sleepy! - Audience automatic clown ascension to the drenched shot! 2nd episode, Jinhyeok captured the eye with a cute intestinal shot holding a squid in his hand. Suhyun was going to pass by looking at the image of Jinhyuk who was drunk, but he turned her car to the falling raindrop and burned it. Jin-hyeo boasts a zipped tie and says, "Of course I both look good. The man laughed at the shot, saying, "I'm a suitor!" Furthermore, Jinhyeok took the squid out of his pocket in the worry of going back to home, and asked Suhyun, who was in his hand, to say, "Am I dirty? My hands were dirty, my pockets were dirty, and my hands were torn apart, and my hands were dirty ". At this time, Jinhyeok's loose balls, unfolded eyes, and tongue-free cute tone made him ascend to the clowns of viewers as well as Suhyeon. - Suhyun, seeing the heart that made me tear down, Jinhyuk Mum before the mood! In the 13th, Suhyun stimulated the lacrimal gland in a way that he was silent in front of Jinhyuk Mom (Paek Jiwon). She was shocked to hear about the relationship between Suhyun and Jinhyeok, asking for a job for her son, and treading Jinhyeok's efforts. After that, Jin Hyuk-Mo, who confronted with Suhyun, begged with tears, saying, "Please let us have a break." Soo Hyun grabbed her gaze as she tilted her head with no tears. Suhyun, who was breathing and trembling like a tree, tore the hearts of viewers. 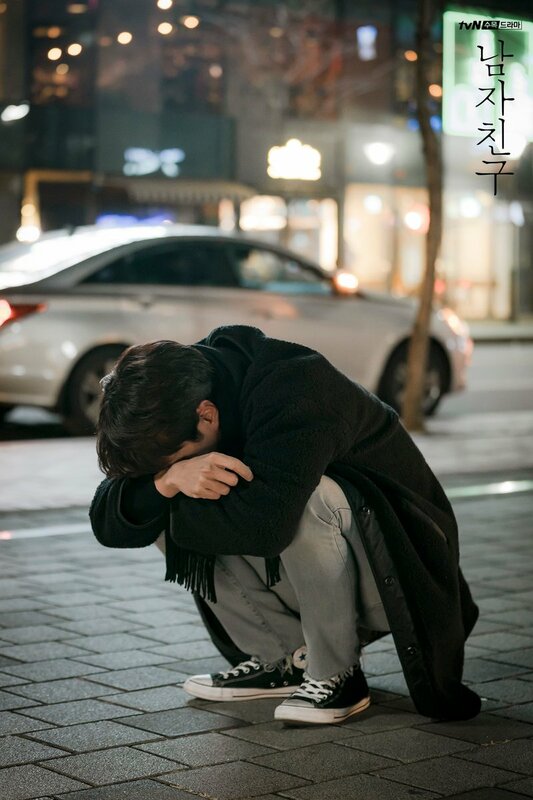 9th episode, Jinhyeok was saddened by the loneliness behind his longing for Suhyun. Jinhyuk, who was invited to the Donghwa Hotel Sokcho, made a heartbreaking bet that Suhyeon and no-nothing were good news, and he could not hide his nostalgia for recollecting the past where he had been with Suhyun. Especially, sitting on the bench in front of the sea where he sat with Suhyun, the gaze of Jinhyuk who looked at the place he was seated and the lonely rear view made the viewers feel sick. Like this, 'boyfriend' Suhyun and Jinhyeok capture the attraction that can not be denied at every moment. Most of all, Song Hye Kyo - Park Bo Gum are filled with the delicate acting power of black tube, making viewers laugh, cry and thrill. There is a growing expectation that Suhyeon and Jinhyeok will show another attraction in 'Boyfriend', which leaves only episodes to the end. Wow..this is the truth..hope both the women in his life realize that asap!! CSH, please trust and believe in KJH and do the best ever together. CSH main weakness is this.she needs to trust him!! I'm so nervous waiting for the live recaps here tonight. I've postponed watching Episodes 13 & 14 thus far, wanting to avoid a cry-fest, until a feel good & happier Episodes 15 & 16 come about (I hope!). The problem is, I watch Kdramas mainly for escapism (real life is already stressful at times.. moan.. whine.. grumble..) and I steer clear away from the ones with sad endings. Because of this, I have a stash of unfinished sad Kdramas that I chickened out from watching their endings. Those of my friends who are avid Kdrama addicts always argue that I lose out on the top quality dramas with this kind of behaviour. Well, to each his own I say. I may be a chicken but the sad endings really really pain me despite the protagonists being mere fictional characters. Having said that, I thought Encounter would be different. It made me squeal happily mostly, from its very beginning. With each watch of Encounter, Episodes 1 to 12, I became more and more invested in Soo Hyun & Jin Hyuk's love story and I felt happier and happier seeing their growing love and the positive effect it had on them both. But after reading the reviews on Episodes 13 & 14, I can feel my "I'm a chicken" mania coming on and I don't think I can take it if the ending episodes this week lead to their permanent heartbreaking separation. So if the upcoming episodes did go down that way, (sob, splutter,) then this will be added to my stash of unfinished dramas. Friend watch episode 13, but skip the last part. There are a lot of good scenes in epi 13. I am usually good with watching angsty movies/dramas and even writing fanfiction stories that are tearjerkers but for some reason, I find myself so so so hesitant to watch the scene between SH and the mother as if it's truly going to break me if I do. Maybe because I read so many sad things about it in this thread? Or maybe I'm just really reluctant to see SH falling apart. This drama, especially the last two episodes, can really make one feel things that almost seems out of this world. I just can't properly explain the fear and the desperate hope of wanting them to achieve more than just a happy ending but the best kind out there. CSH is just as one of a kind like KJH. I promised myself last week that I would watch 13 and 14 on Tuesday so I wouldn't suffer too much but after seeing ep 13 and stopping exactly before the last scene of the episode, I found myself backing out and being a coward. Anyway, 6 hours feels like waiting for some sort of court (death) sentence or something. I'll watch that scene, ep 14, and 15 altogether and save myself from early heart-stopping heartbreak. @bubblechoco will you be doing live recaps? If you are then I might pass on live recaps this time, last 4 episodes I keep getting kicked off the stream. @dukesa1122 Thanks, I’m fine just bummed out that the drama is getting over. I wanted to post something and see what everyone thought but I’m going to wait till the drama gets over so that we have something to discuss after (dreaded) Thursday. For the sake of your chingus in the thread, please brave tonight's episode. Of course, we are so happy to have @bubblechoco around to help in the live recap...but having both of you would be such a treat for all of us in the thread! Whatever happens, we can get through this! @bubblechoco: For as long as it will NOT jeopardize your studies/work. On another note, I recently discovered this song by Roy Kim titled "Hug Me" which literally made me cry thinking about CSH's character. This so fits so much with the drama, especially in the recent episodes. Give it a listen. Here are the lyrics which I found in the comment section. It absentmindedly wakes me up again in the morning. In the countless nights I spent resenting you, It feels like I’m in hell. All I have to do is take a step closer, isn’t it? Those empty eyes, that cold expression. You’re quite a pretty person, aren’t you? You know me well enough, don’t you? Remember the new JTBC Traveler's show that was going to Cuba influenced by the popularity of the drama? what a wonderful lyrics. For anyone who suffered greatly from a break-up could relate to how painful that song is. Is there a possibility for no live recaps tonigh? Why do I feel relieved and dismayed about it? Dont know when Im gonna see SHK again. It might take longer than usual because you know.... hoping for one more project though!